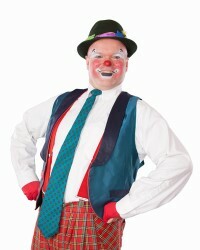 I am BigTop the Clown AKA Richard Melendy. I am a popular area entertainer and a former Ringling Brothers & Barnum & Bailey Red Unit Circus clown. Performing with Ringling Brothers Circus was a dream come true. In the circus, I learned how to perform on a large scale. It gave me the opportunity to perform with artists from all over the world. been bringing smiles and laughter to children of all ages. Keaton, Charlie Chaplin, to name a few. In terms of pantomime, Marcel Marceau inspired my mime abilities. My favorite physical comedy bit is the pie in the face. I have been in many hilarious pie fights to the delight of my audiences.In addition to my clowning abilities, I am a fine artist, who paints, draws, and illustrates. I have a B.A. in Art History from the University of Southern California. 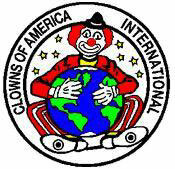 I teach clowning as well as drawing and painting to children. Currently, I teach summer workshops through the City of Hermiston Parks and Recreation. 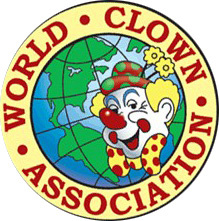 Here in the Tri-Cities, I have clowned and continue to clown at events at/for the Boys and Girls Club, Washington State Closure Hanford, the Tri-Cities Ballet Academy, the Mid-Columbia Mastersingers, YMCA, the Mid-Columbia Libraries, the Carousel of Dreams, First Night, the Tri-Cities Family Expo, Kadlec Medical Regional Center, the Waterfollies, The Reach, City of Richland Parks and Recreation, National Night Out in Kennewick, the Old Country Buffet on Canal Street in Kennewick, the Kiwanis Club of Horse Heaven Hills, Gesa Stadium-( the Tri-Cities Dust Devils), Gesa Credit Union, Bills Berries Farm in Grandview, the Yakima Valley Fair, All Star Motors, the Tri-Cities Cancer Center, and many other companies and organizations, wherever children of all ages need entertainment. In addition to company events, I perform at birthday parties. Copyright (c) 2007 All Rights Reserved.